and one lucky winner will get a Kindle Fire HD 8 just for playing along. June 10th through June 16th. How to enter: Entries consist of following the directions (comment, "like," etc.) given in the official promotion posts on the KiDDS Dental Facebook page between June 10, 2018 at 9:00 AM and June 16, 2018 at 5:00 PM. One entry per promotion post per Facebook user is allowed. Multiple entries per promotion post will be disqualified. Drawing: One random prize drawing will be held on or about June 19, 2018. 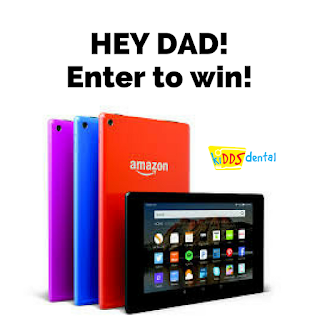 The winner will receive a Kindle Fire HD 8. This prize is valued at $89. Cash cannot be awarded in lieu of prize. Prize is not transferable. The winner is solely responsible for reporting and paying applicable state and federal taxes. If a winner is disqualified or if a prize is unclaimed, KiDDS Dental reserves the right to conduct another drawing to determine an alternate winner or to not award that winner's prize, at its sole discretion. Eligibility: Legal residents of the United States are eligible to participate and win. Any person under the age of 18 must have a parent's or legal guardian's permission to participate and/or win. Must be 13 years or older to enter. Employees of KiDDS Dental and their immediate families (spouse, parents, siblings, children, in-laws) are not eligible to enter. Winner must be available to pick up prize in person at KiDDS Dental in Liberty Lake, WA by June 28, 2018. Decisions: By entering into the promotion, entrants and their parents or guardians (if the entrant is under the age of 18) agree to abide by and be bound by these official rules, and to accept the decision of KiDDS Dental as final. Entrants and their parents or guardians (if entrant is under the age of 18) also agree to hold KiDDS Dental harmless from any liability arising from participation in this promotion. KiDDS Dental is not responsible for entries not received because of technical difficulties. KiDDS Dental reserves the right to disqualify any participant to a person who fails to follow these official rules or uses fraudulent means in participating. If for any reason this promotion is not able to be conducted as planned, KiDDS Dental reserves the right to cancel, terminate, modify or suspend this promotion and randomly draw from the entries received up to the cancellation/suspension date. Liability Release: By participating, each participant and winner waives any and all claims against KiDDS Dental their employees and agents for any personal loss of any kind which may occur from the participation in the promotion. Publicity: Each winner (and such winner's parent or guardian if any winner is under the age of 18) agrees to permit KiDDS Dental to use his/her name and likeness in promotional and other KiDDS Dental materials, without additional compensation or permission, except where prohibited by law. By entering the contest, entrants grant KiDDS Dental license to display, distribute, reproduce contest entries. Winners must sign a media release and will be responsible for paying any taxes they may owe on a prize.